Obituary for George D. Hagerty | Donald R. Crawford Funeral Home, Inc.
George David Hagerty of Uniontown, Pa and formerly of West Newton, PA went to meet Jesus on Feb. 9, 2019 after 90 blessed years here on earth. He was born Jan. 7, 1929, the son of the late George and Iola (Sickles) Hagerty. He was preceded in death by all his brothers and sisters, Doug, Shirley, Sandra, and Neil, and by his first wife Betty J. (Morris) Hagerty, and by his son, Gerald Bruce Hagerty. He is survived by his wife Wanetta (Marker Lee) Hagerty, a daughter Patty (Hagerty) Bell and her husband Jim Bell of Uniontown, PA, a grandson Patrick Bell and his wife Aileen (Kinneer) Bell of New Stanton, PA, a great-grandson Lennon JC Bell, stepchildren Donnie & Renee Lee, Susan & Bob Smith, Mary Jane & Larry Poling, and Laura & Richard Peters, and numerous step-grandchildren and -great-grandchildren. “Pap” loved and was loved by all his grandchildren and great-grandchildren. George was a man of many talents and interests. After honorably serving in the United States Marine Corp, he worked at and retired from the US Steel Irvin Works in 1987. In his retirement, he worked as a professional chauffer driver, a school bus driver, and was elected to and served on the Albert Gallatin School Board. 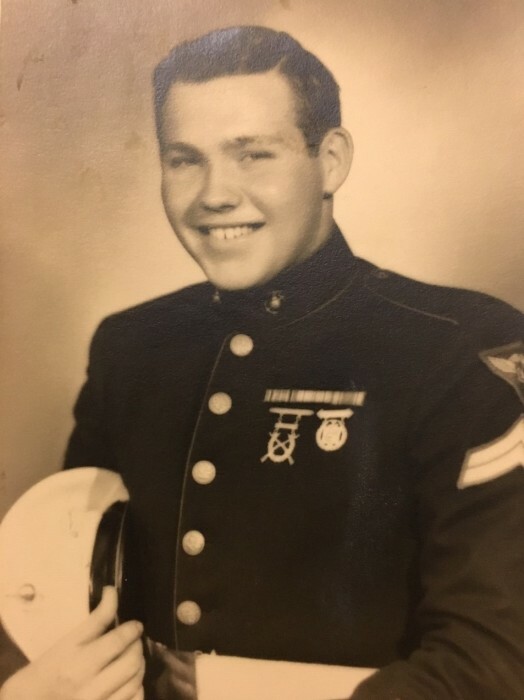 Throughout his life, he had many interests and vocations: construction worker, landscaper, auto mechanic, furniture and home builder, and small engine repairman. He was an avid gardener, hunter, fisherman, and all-around tinkerer. Most of all, he was a patriot who loved America and the Constitution of the United States, and he believed that true freedom was earned by taking responsibility for one’s own actions and life choices. Friends will be received in the Donald R. Crawford Funeral Home Hopwood, Pa Wednesday February 13,2019 from 2-4 and 6-8 and Thursday February 14, 2019 until 11:00am the hour of the service with Pastor Roger Diehle officiating. Interment will follow in West Newton Cemetery. Arrangements by Donald R. Crawford Funeral Home Hopwood, Pa.
Semper Fi Pap, we will miss you! !